Consumers around the world are feeling the pinch of high food costs and many have changed their eating and shopping habits, according to the Food Marketing Institute’s U.S. Grocery Shopper Trends report for 2008. As concerns about rising food costs continue to grow, consumers can take some simple steps to save money on their grocery bills. 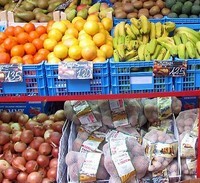 Here is the 22 ways to fight rising food prices to lower your grocery bills. 12. Look Down – To find less expensive items, look down.